Leap forward several years, there's been a lot of adoption of SAP virtual landscapes thanks to leaders like VMWare, while at the same time SAP environments have gotten much more complicated with large landscapes and myriad of platforms, such as Cisco and SGI. It's not uncommon for basis teams at a large SAP customer to manage multiple landscapes, each maybe comprising of upwards of 7 SIDs. Many systems are cloned, refreshed so often as required by business needs for upgrade projects, performance testing, etc. Thus the workload to set up, clone/refresh, monitor, and manage those resources put a heavy burden on the Basis team. 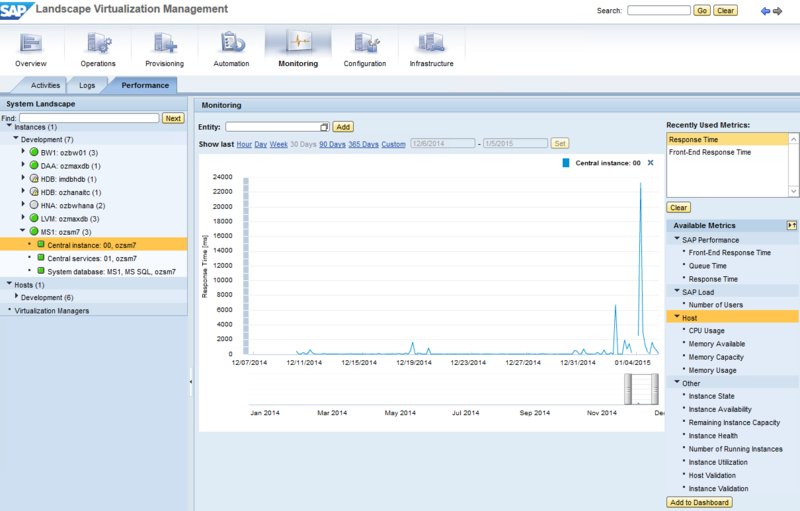 This is where SAP LVM value proposition lies. There are lengthy FAQ written by SAP (http://scn.sap.com/docs/DOC-34907). So I thought we'd go and install LVM 2.1 and take it for a test drive to see the level of effort to install, configure and get some initial impressions. It took about 40 hours to complete the initial install and basic configuration, first came the SAP NW 742 Java installation, then SUM (Software Update Manager) to install LVM 2.0/2.1 Java application archives, and last but not least to configure some instances for it to detect and monitor. 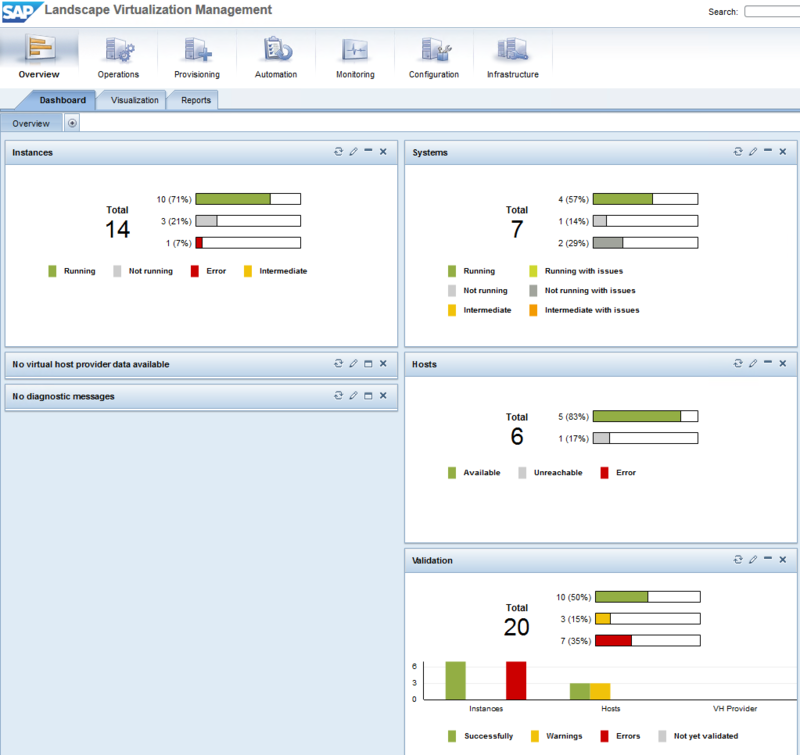 When you first login you get the Overview and the default Dashboard showing the status of systems you configured (SAP systems require SAPHostAgent installed to be managed). Ideally one would need to organize them in appropriate pools to group the resources to be managed. 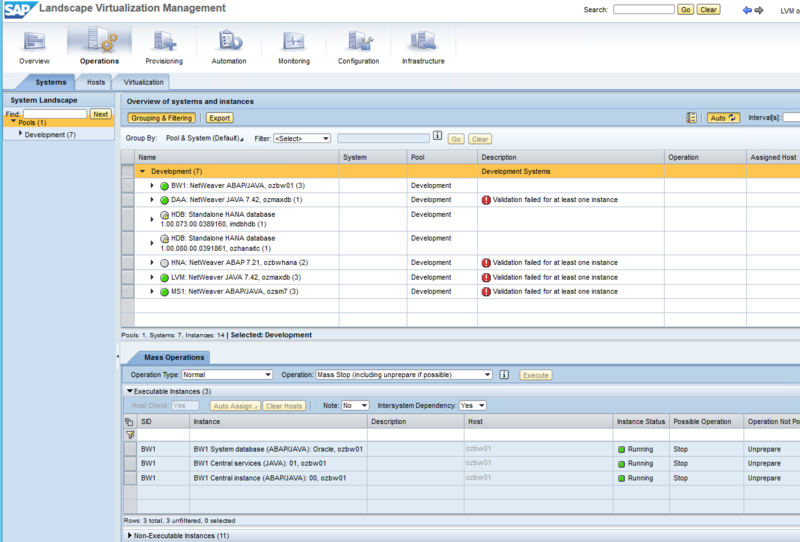 In Operations, there are useful features to perform mass operations like Stop/Start which can come in handy if you've ever worked an SAP maintenance window when you have limited time and hand to coordinate stopping and restarting of systems. This is where some common operations can be performed like system validation (e.g. space check, high-availability configuration, etc.). For scheduling some of these tasks, an Automation view is also available. I suppose this would be where PCA (Post-Copy Automation) would take place and is of time-saving value, but that's a whole big topic for another post when we have a chance to test it out. There are 2 editions of LVM, Standard and Enterprise and it looks like the neat stuff like Reporting, Performance Monitoring, System clone / copy / refresh are all in Enterprise and is a paid product. I'm not sure how much. Reminds me of the Wiley Introscope integration with Solution Manager. It might turn into a full fledged license and environment to manage to make it useful. I'm curious what's your thoughts are and if SAP will ever have a simple integrated platform that doesn't require a team of experts to install & manage, and can address the needs of Automation, Monitoring, Management and Optimization (AMMO as we call it at IT-Conductor). Do you have experience with LVM or something similar? What are your thoughts?